Did your site / blog get blasted lower in the rankings with the latest Google Algorithm updates – named “Panda”? Mine did, along with many others. I did a lot of research into why many sites fell – what I found made sense. Content. Content matters to Google more now. Common SEO practice used to be to produce short posts or content, but do it frequently to improve your rankings because somehow “fresh” content, even though it was sparse, was somehow better than longer, stale content. When I took a look at my content, much of it was medium length (350 words). But some of it lacked polish. Polish from all sides really. My content should have been longer. It should have included more resources. It should have been easier to read with more headlines, bullets, and boldfaced text. I left superficial content about minor news on the site. The Google algorithm finds the best content and presents it to users. To be effective, the algorithm must think like a human editor. Sometimes it gets fooled by content owners who try to trick the algorithm. That’s when the algorithm writers tweak the algorithm to shake out the scammers and let the best content rise to the top. A lot of people online were angry that their sites, which they thought were quality, were knocked out of the rankings. I stand by this Google Panda rolling update. The algorithm thinks more like a human. Writing quality is valued. Length and production time are valued. Research is valued. Original thought and ideas are valued. This is good for the Web. It’s the reason The New York Times is frequently quoted more than a local newspaper. But when the algorithm is out of whack, a local newspaper could outrank The New York Times. It shouldn’t be. Chances are, if someone takes the time to leave a comment on your blog, and that comment is a question, you probably haven’t covered the topic well enough. I’m amazed at the repetition of some of the comments. Did I explain the topic clearly enough? That might be a clue I didn’t. If you are missing pieces, too vague, or just wrong, commenters will point it out. Incorporate their feedback. I did and it paid off greatly. As you can see, I’m still in the process of SEO optimization, but the results are clear. Basically, I’ve seen a 600%+ overall increase in search impressions and clicks according to Google Webmaster tools. I suspect this will go even higher as I continue to add content to existing posts – including this one. As far as the drop off when panda started, the Google Webmaster Tools won’t let you see further than a month back, but I can tell you my site and key blog posts were at higher levels. Killer Adsense Ads or Kill the Adsense Ads? Ads can play a big part in SEO now. We have learned how we can gauge how many ads are too many. 1. Open the site in a new browser. 2. Expand the browser to a minimum of a 1024 x 768 pixel display. 3. Make sure you have minimal browser menus and your font is set to medium or normal. 4. Scroll to the very top of the page, as evaluation is based on what appears above the fold. 5. The site is considered compliant if the area of ads is less than or equal to the area of content. Let’s also not forget ads slow down a page, and Google’s inclusion of a Site Speed section in the new Google Analytics shows site speed is an increasingly important ranking. You definitely want some ads on your site, but just be sure you provide more value than ads. I think people forget that HTML tags like <strong> (bold) and H3 (header) MEAN something to Google. They don’t just help layout. They tell it what is important on the page. It knows bulleted lists help users comprehend what they are reading better than straight copy sometimes. HTML5 is all about semantic markup – not just generic tags. It gives Google a clue as to what is the meaning of this content within certain tags. If you use Google’s Webmaster tools, one thing to look out for is the number of links Google has indexed from your sitemap and how many are left out. You want this to be 100%. All links in your sitemap should be indexed. Remove all superficial and wasteful pages! Instead of posting more, spend your energy improving existing posts / making them longer. You will get more hits and linkbacks with strong content that WILL push you higher in the rankings. CMS engines like WordPress add useless tag pages and some category pages that generate duplicate content / superficial content. Block them with a Robots.txt file. It should be noted that what’s good for Google can also be good for Bing. I’ve never ranked well on Bing. I hope that will change. From what I’ve researched, Bing takes into account content length as a significant factor. So by increasing content length, you cover both major search engines. I believe Bing to be “dumber” algorithm that relies more on external links to sites. It’s harder for the little guy to rank well that way. Google gives rank based on about 200 variables and lets the best content rise to the top on its merit. With search such a significant source of traffic – quality traffic usually, you can’t ignore optimizing your site for Google. But remember that longer content is always more shareable – so spending more time creating each post or page helps get a viral lift. Google’s Matt Cutts said that the best way to do SEO on a small budget is to use a small niche to your advantage. As you get well-known in that space, you can gain rank and build out to more broad topics. Focused sites are better sites. There are plenty of small sites that turn a profit because niche marketing usually targets enthusiastic people. I’m not into diving or cupcake making, but I know people who love it. Usually niches evoke strong feelings from people – those people subscribe and buy. Usually when you search for a small topic the search results are so bad that it’s easy to come up on top. A well marked-up site with proper meta tags will be well presented in the results page. Bing in particular presents well marked-up pages beautifully in the results pages. Most of all I learned the importance of being original. I learned I can never compete with larger organizations head-on. And that’s fine. I know they can’t compete with me because they don’t have my original ideas. I don’t think faceless corporations care about people the way I do. I’ll let the people decide about my content. Now run and tell that, Google. Get all my free Google Analytics reports here. 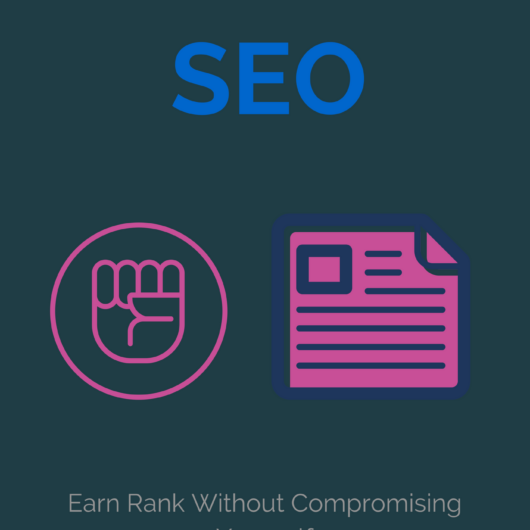 Have you tried SEO that worked for you after Panda? Please share and let the community know. Get the Complete SEO Book! Useful insights Ken. I have been improving my content as well to get around Panda and just another validation from my end for your theory of better ranking with bigger and better content. In one way, this has made me a better writer and connect better with my readers. Google has always loved long and good content. Bloggers should also use long tail keywords and Latent Semantic Indexing to their advantage! OK, Ken spill the beans. What Panda hit? What % down? How much up now? 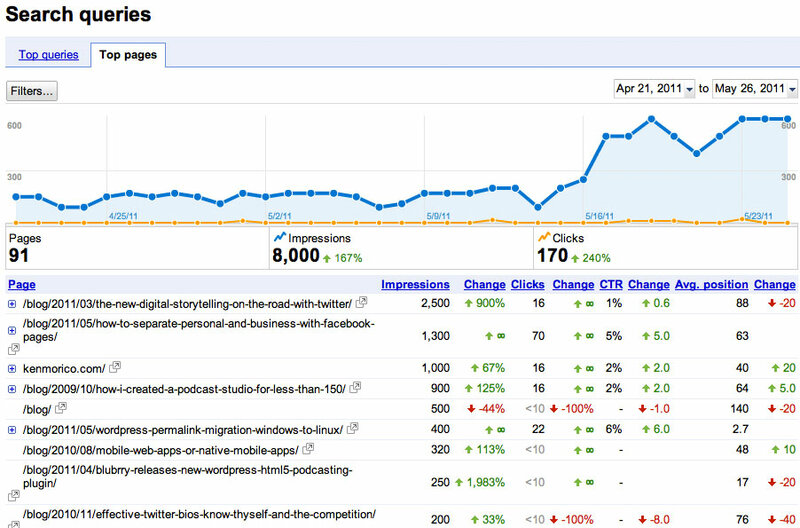 OK, I added a chart of search impressions and clicks. Click on the chart to expand. Basically I’m up 600%+ . I suspect this is just the start of a large traffic boost for my site. My key terms like “Web 2.0 resume” weren’t even on the list once Panda hit and my traffic basically stalled. Since I’m not a full-time blogger, it wasn’t massive amounts of traffic lost, but it got the point where something had to be done. It seems like a LOT of people feel the same way. You mentioned “When I took a look at my content, much of it was medium length”. Can you specify an average word count for your definition of medium length? Is it somewhere around 200 words? After you beef up content to a particular page, how long did it take before you saw any positive improvements? I feel that the panda update is some sort of penalty where once we get drop into the panda bin, most of our keyword rankings will drop a couple of spots or even pages. Checking against non english query Google like google.co.th still shows that my site ranks ok (just like pre-panda) results. On my end, I removed and noindexed many pages that I consider shallow / thin. The url removal tool in WMT definitely helps. Just completed cleaning up junk pages on Google index and now I’m hoping for some sort of recovery. Thanks for your article. I will take your suggestion on checking against analytics for keywords that users use to find my page and beef up content accordingly. Lots of work to be done to escape the Panda Poop. Hope it’s worth it. Hi Bob. My original posts were around 350 words, sometimes more. Right now the length that is working for me is 800-1100 words. It took me about 2 weeks to see improvement in my posts with Google, because once you lose some of your credibility with Google it takes a lot longer to crawl your site. It used to be that my new posts were indexed within a few hours. Now it takes about 2 days. One thing you can do which would be easier than tossing content is to combine pieces of content from pages you want to noindex and make a larger post out of the bits if possible. Remember that code and CMS engines add a lot of gunk, so the actual amount of content from Google’s perspective can appear small. At 1100 words, it’s obvious to Google it’s a content page. Hope this helps. Thanks! The Google Panda update has really made me think seriously about my blog. With SEO it’s important to get a “man on the street” view since they change the algorithm regularly.